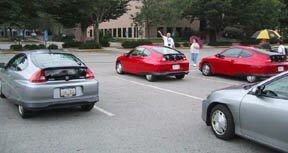 Here are my photos from the fantastic gathering of devoted Insight Owners. More text will appear here after I write it. You can't see the silver Insight that slipped into the front row at the far end in this photo. Almost ready for the big picture. Larry awards prize to Bambi. George describes how he installed his cruise control. 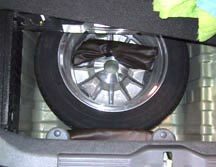 You CAN fit a full-size spare in place of the mini-spare. Also, a great plate from the most distant state to attend. Insight owners hear about Columbus State Community College's solar powered racer. 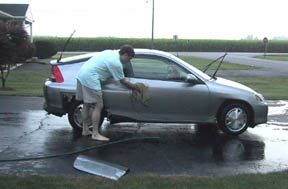 I washed my Insight before leaving for Columbus hoping it wouldn't rain, but it did. At least the hard rains waited until my wife, Mary, and I were on our ride home. Despite arriving in Columbus carrying an 80-mpg average (which crumbled to 78 mpg while I searched Columbus for the Columbus State Community College), I didn't even come close to the 85 mpg that took the prize for best mileage on the way to the meet. And my 57.5 mpg lifetime average looked really poor compared to Bambi's fantastic 67 mpg lifetime average!